Benjamin Banneker, a mathematician, astronomer, and farmer, helped survey the boundaries of the new city of Washington, D.C., and was the publisher of a popular almanac noted for the accuracy of its calculations. Benjamin Banneker, a mathematician, astronomer, and farmer, helped survey the boundaries of the new city of Washington, D.C., and was the publisher of a popular almanac noted for the accuracy of its calculations. In an exchange of letters with Thomas Jefferson, he challenged Jefferson’s prejudice against the intellectual capacities of African Americans. He was born in Baltimore County, Maryland, the oldest of four children and the only son of a freeborn African American mother, Mary Banneky, and a West African father, Robert, who had bought his own freedom from slavery. When Robert married Mary Banneky, he adopted her surname and changed it to Banneker. Robert Banneker was a successful tobacco farmer who purchased a 100-acre farm where Benjamin lived his entire life. Benjamin Banneker’s maternal grandmother, Molly Welsh, had emigrated from England as an indentured servant. She obtained her freedom and married an African slave named Banneka or Banneky—said to be of royal decent—after purchasing and freeing him. Molly Welsh was literate and taught her grandson to read from the Bible. Banneker had little formal education, though he may have briefly attended a Quaker school. But he was a voracious reader, and with books borrowed from a Quaker teacher, he studied literature, mathematics, and science. When he was in his early twenties, he reportedly met a European trader who allowed Banneker to study the inner workings of a pocket watch. Banneker was able to calculate the sizes and ratios of gears and other parts and to carve them of wood to create a clock that kept accurate time for the rest of his life. At the death of his father in 1759, Banneker took over the tobacco farm. In the 1770s, a family of Quakers from Pennsylvania, the Ellicott brothers, began to develop a mill town nearby, and Banneker became friendly with them. One of the brothers, George Ellicott, was an amateur astronomer. 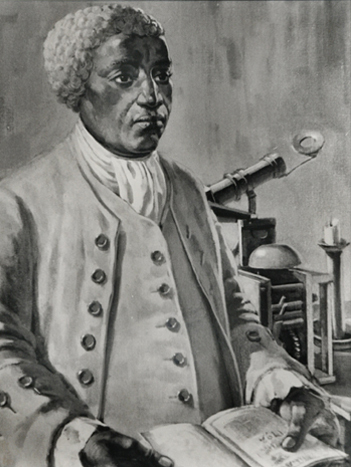 He lent Banneker a telescope and astronomy books, and Banneker taught himself how to calculate the positions of the sun and moon. In 1791, George Washington appointed another Ellicott brother, Andrew Ellicott III, to survey land for the new U.S. capital that would be built along the Potomac River. Ellicott requested that Banneker be designated his chief scientific advisor. Banneker had studied surveying and played an important role in determining the boundaries of the new federal city. As advancing age made farming difficult, Banneker sold his land but remained in the family home. After attaining public notice for successfully predicting a solar eclipse in 1789, he turned his energies to producing a series of almanacs that were published from 1791 through 1802. Along with his highly accurate calculations of celestial movements and predictions of tides and eclipses, the almanacs included medical information and other material of interest. On publishing his first almanac, Banneker sent a copy to Thomas Jefferson, who despite having penned the famous words “all men are created equal” believed that Africans and African Americans were intellectually inferior to whites. Banneker urged Jefferson to rid himself and others of the notion of racial superiority. Jefferson replied, praising Banneker’s accomplishments and saying that he had sent the almanac on to the Academy of Sciences in Paris. Banneker died at home in 1806. During his funeral, a fire destroyed the house, including all his scientific papers.